A scene from the Mugunga IDP camp on the outskirts of Goma, in the Democratic Republic of the Congo on 17 December 2012. Fourteen years since the adoption of Security Council resolution 1325 in 2000, significant progress has been made on the women, peace and security agenda. There is growing recognition that women’s empowerment is a key ingredient for democracy, stability and lasting peace. Yet, the increased violence, mass displacement and humanitarian catastrophes of the past year have had a detrimental impact on the security of women and children — particularly girls — hindering progress towards achieving peace, security, reconciliation and stability for all. The tragic human cost of current conflicts is starkly visible in the situation of refugees, asylum-seekers and internally displaced persons (IDPs). By the end of 2013, 51.2 million people had been forcibly displaced — the highest number in the post-World War II era. While in 2011 violent conflicts forced some 14,000 people worldwide from their homes every day, in 2013 this number escalated to 32,000. Three-quarters of the refugee and IDP population are women and children. Displacement, refugee status and statelessness exacerbate existing gender inequalities. Gender-based discrimination in access to economic resources; education and employment; poor reproductive health care; and exclusion from decision-making processes make refugee and IDP women and girls one of the most vulnerable groups in the world. On 28 October 2014, the UN Security Council will convene its annual Open Debate on Women, Peace and Security, with a focus on “Displaced Women and Girls: Leaders and Survivors.” The protection, human rights, participation and access to humanitarian assistance of women and girl refugees and IDPs have been a concern of the Security Council since the adoption of its landmark resolution 1325 in 2000. The debate will address commitments made to the situation of refugee, internally displaced and stateless women and girls, including the seven resolutions adopted by the Security Council on women, peace and security. The new report of the UN Secretary-General on women, peace and security (S/2014/963) highlights the progress, gaps and challenges in implementing resolution 1325 over the last year, and calls for all actors to leverage its strategic high-level reviews in 2015 to ensure gender equality is included in peace and development. This year’s debate occurs on the heels of the launch of a Global Study on the implementation of Security Council resolution 1325 and amid preparations for its 15-year anniversary and High-level Review in 2015. In collaboration with partners, UN Women is currently supporting implementation of women, peace and security commitments in more than 35 countries. This includes: support for strengthening women’s peace coalitions and help to prepare them for engagement in peace processes; work with peacekeepers to help detect and prevent conflict-related sexual violence; support to build justice and security institutions that protect women and girls from violence and discrimination; and initiatives to promote gender equality in humanitarian responses and public services that respond to women’s needs, ensure women’s access to economic opportunities, and build women’s engagement in public decision-making at national and local levels. Watch the webcast of the Open Debate live here on 28 October 2014 at 10 a.m.
An award-winning Iraqi lawyer and activist for women’s rights from Sadr City in Baghdad, Suaad Allami was invited to speak at this year’s Security Council Open Debate on Women, Peace and Security. She gives us a glimpse of how thousands of Iraqi women and girls are coping with displacement. With support from UN Women, women leaders in the Balkans are putting gender issues at the centre of politics and fuelling women’s empowerment in order to bring peace and stability to the region. Nearly 50 Syrian women from within and outside the country came together at a conference in Geneva to appeal for peace, a voice in the ongoing political negotiations on their country, and for the world's attention to the ongoing tragedy facing their people. Here, a number of them share their hopes for Syria. A special training course in Bogota, Colombia is providing participants with the skills to investigate cases of sexual and gender-based violence related to conflict. Through self-help groups, grants and gardens, widows, single moms, and survivors of violence are gaining economic independence in rural Timor-Leste. UN Women’s Executive Director visited UN Women’s Oasis, a safe space for women to seek support and skills training in Jordan’s Zaatari Refugee Camp. Women are cultivating mushrooms and tomatoes, learning about business and agriculture and pooling their funds along with combating social stigma and confronting gender-based violence. Join the online conversation about the UN Security Council Open Debate on Women and Peace and Security! Use the hashtag #UNSCR1325 on Twitter to share your thoughts. A social media package with images and messages in English, Spanish and French can be downloaded here. Nearly 50 Syrian women came together from within and outside Syria at a conference, facilitated by UN Women, from 11 to 13 January 2014 in Geneva to appeal for peace. They call for a voice in the ongoing political negotiations on their country, and to draw the world's attention to the ongoing tragedy facing their people. Here, a number of them share their hopes for Syria. 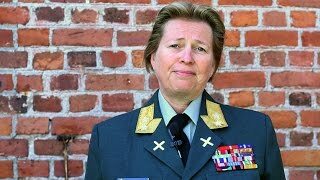 Major General Kristin Lund of Norway is the first woman ever to be appointed as Force Commander in a United Nations Peacekeeping Operation, and is currently serving with the UN Peacekeeping Force in Cyprus (UNFICYP). A role model for many, she has held several top leadership posts in a male-dominated profession.